What are Your Favorite Works of Art? | Jorge Sette "Linguagem"
Living in São Paulo is an advantage for those who love what is usually called High Art, as we have a fair number of museums in the city. Of course, we lack the spoiling infinite choices of those who live in places like London, Paris and New York, but things could be worse. However, going to a famous exhibition in Sampa is not without its frustrations and annoyances, as there are usually long lines on the weekend and the facilities are far from excellent. Besides, I’m quite addicted to audio tours, which, unfortunately, are not very common in Brazilian museums. I can’t stand guided tours, so I never join those little groups of people who follow a uniformed museum employee listening in awe whenever the guide decides to stop in front of a painting of her choice to spill out all the memorized knowledge in artificial intonation. I tend to run in the opposite direction. So it’s not surprising that my best experiences in art viewing will have taken place abroad. The objective of this post is to share and discuss with my audience four of the great masterpieces I’ve already had the chance to see in person. I don’t think there is anything wrong in admiring pieces of art through apps, books or video, but I’m sure we all agree that the experience of standing only a couple of centimeters away from a great sculpture or painting in a beautiful museum can not be beaten. 1. 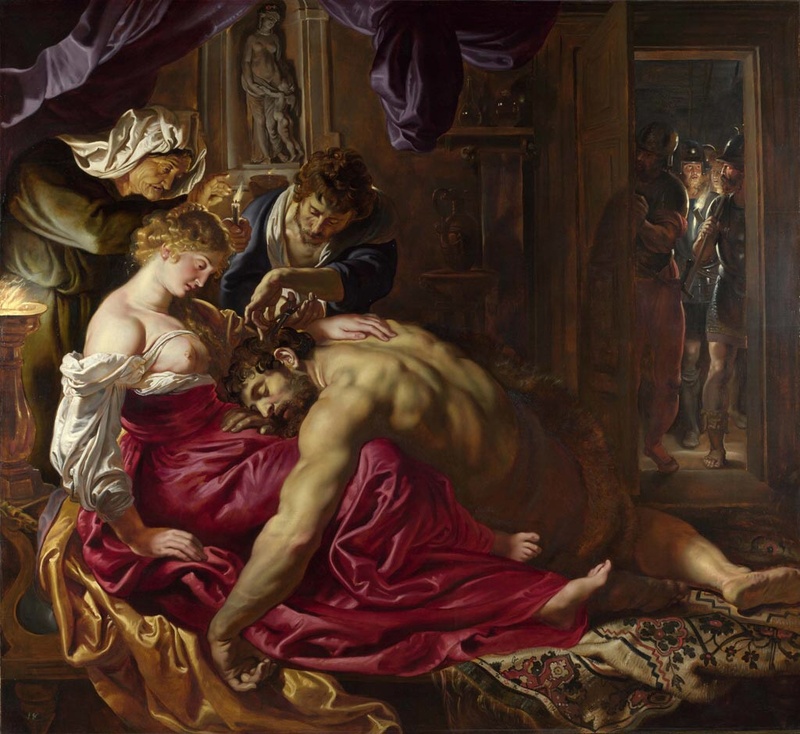 Samson and Delilah, by Peter Paul Rubens: I first saw this painting while roaming through the rooms of the National Gallery in London last time I was there. My eyes were immediately drawn to it for its vibrant colors, strong subject matter and unique distribution of lighting. You can see Samson, of biblical fame, sound asleep on Delilah’s lap while his hair, source of huge strength, is being treacherously cut off. The Philistines are already waiting there on the doorstep to take him away and blind him. The painting by Rubens is highly sensual and yet poignant, and, to me, its relevance can also be traced to my childhood, when I first heard the story and was deeply impressed by it. 2. 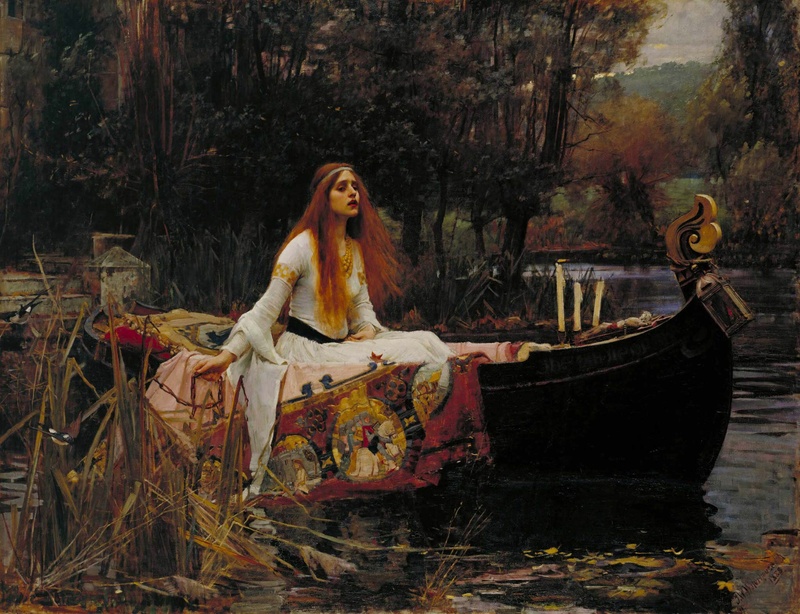 The Lady of Shallot, by Waterhouse: I have a funny personal anecdote about this painting. 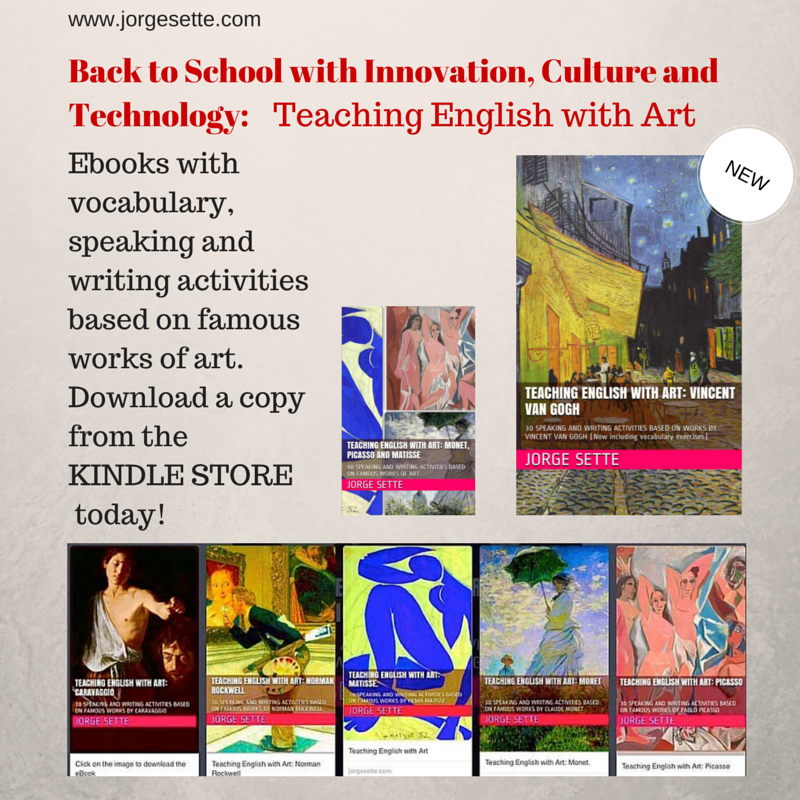 I had discovered it on an app about art and fallen in love with its bright colors and hippie-like atmosphere (although it was painted almost 100 years before the “flower power” movement). I have always been a fan of the romantic sixties and its music. Pre-Raphaelites, therefore, with their drama and romance, feature among my favorite painters. Well, a couple of years ago, I was in London for work and had an afternoon off. I decided to invest the time visiting the Tate Gallery, with the sole purpose of seeing this particular painting. My surprise was that, as I entered the museum, for some reason, I marched straight up to the room where the picture was hanging, without ever having been there before. I had passed other rooms on my way into the museum, but somehow this was the first room I got into, after making a left off the main passageway. I could only interpret this, of course, as fate. The Lady of Shallot, just like a magnet, had dragged me to the place. She probably was as eager to meet me as I was. The painting itself is a bit too high on the wall and the colors are somewhat faded in comparison to the copy I had on the app. But still it’s impressive, and remains one of my favorites of all time. The Lady of Shallot, 1888, by John William Waterhouse, Tate Gallery. 3. The Thinker, by Rodin: In my teenage years in Recife my mother used to introduce me to her friends who came to our house as “the thinker”, the son who would spend hours either reading or staring into the void in front of our backyard garden with his mind going places she could not fathom. 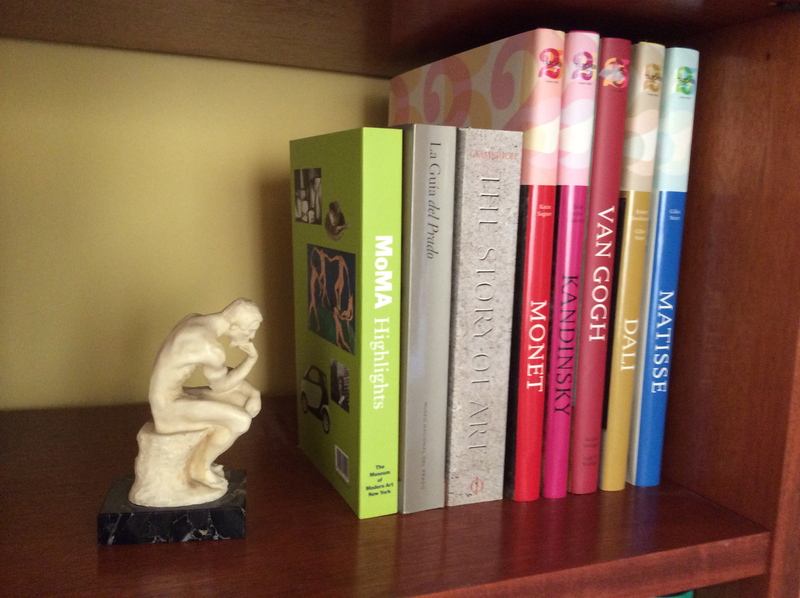 When I was still in high school, she gave me a little marble figurine in the shape of Rodin’s The Thinker, which she had acquired as a souvenir in Europe. This little gift is one of my most treasured objects and I keep it in my living room to this day (see picture below). Therefore, years later, I teared up with emotion when I first laid eyes on one of the versions of The Thinker, brought to the Pinacoteca in Sao Paulo as part of a huge Rodin exhibition in the mid-nineties (we had to stand in line for hours, and, once inside, needed to rush through the pieces as if in a car race, so many people attended the event everyday). A couple of years later, however, I could indulge in as much Rodin as I wanted too, roaming freely around the rooms and gardens of his Museum during a sunny summer day in Paris. My little version of THE THINKER by Rodin. My living room. 4. 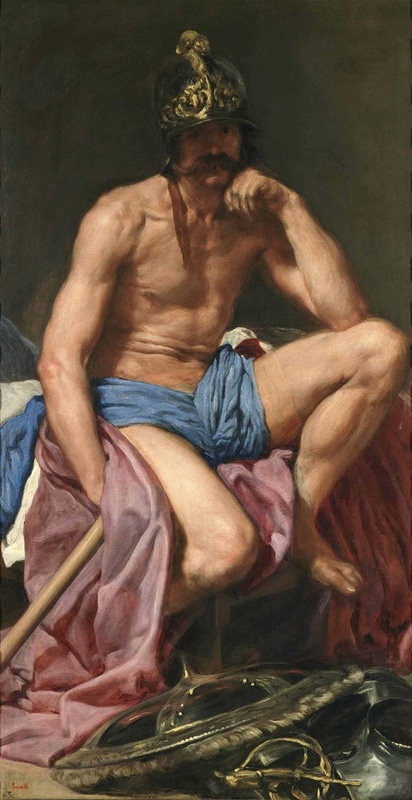 Mars, the God of War, by Velázquez: The pressures against growing old – or really, the prejudice one confronts after reaching 30 – are mounting in today’s infantilized society, and it’s hard not to feel progressively inadequate and afraid. Obviously one keeps postponing – for himself – the cutting off date after which you should be considered old: it’s usually at least 10 years ahead of your current age. Therefore it was with a warm feeling of relief and reassurance that I came across this riveting Velázquez’s painting at Museo del Prado in Madrid: it dares to show the god of war, Mars, as an emaciated and tired middle-aged man, with his stunning shield lying on his feet. My conclusion was that, if even the gods need to confront the aging process, it should be OK for the rest of us. Mars, God of War, 1640, by Velázquez. Museo del Prado. There are many more pieces I’d love to write about. I promise my loyal readers to get back to the subject in future posts. For now, I believe this will give you a preview of my taste in Art. What about you? What are your favorite pieces of art? Share them with us. This entry was tagged rodin, the lady of shallot, the thinker, velázquez, waterhouse, works of art. Bookmark the permalink. Great choices!! Thanks for the feedback, Ana.